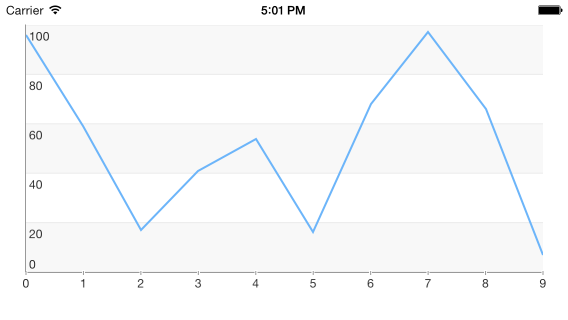 This quick start tutorial demonstrates how to create a simple iOS application with TKChart. If you are writing Swift, add the same line in your bridging header. This code creates a new instance of TKChart and adds it as a subview of the ViewController's main view. The autoresizingMask property is set in order to allow correct resizing of the chart when the device is rotated in landscape mode. In this case we use the i variable as an x value, and we generate a random number in the range between 0 and 100 as an y value. The TKChartLineSeries tells the chart to present its data as a line chart and initializes it with the already created points. For more information about series types, please refer to the following articles: Chart Structure.